All About Freya, the Catfish. I am Ellie (the human), and I am here because of a beautiful (and a bit too smart) dog named Freya. My husband and I had never heard of the dutch shepherd, so 3.5 years ago we were completely catfished. The plan was to get another dog to play with our lab x staffy (Murphy) to keep him active while he was still young. The shelter had Freya listed as a 1 yo shepherd x Australian cattle dog mix of some kind. She was super friendly immediately and the trainer had her show off how smart she was. We brought Murphy in to meet her and they got along great, plus they are adorable next to each other, perfect opposites. We knew with the cattle dog that she would be high energy but we lived in the woods and hubs wanted a trail running partner so no biggie. We were told that she had been surrendered by the owner's neighbor because she belonged to the kid who wasn't taking very good care of her (after talking with the parents). 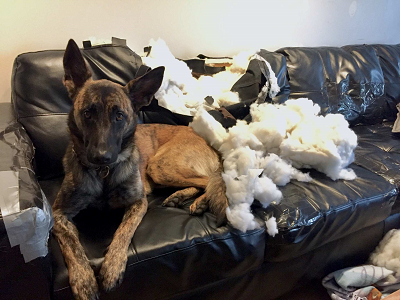 We got her home and we were having a hard time training her so I looked up information about working with shepherds specifically, and that is when I saw a picture of the Dutch Shepherd. A bit of googling and she matches the description perfectly: loyal but independent, intelligent, protective, stubborn, high energy, high pain tolerance, very athletic, etc. She has some serious "quirks" that we were able to manage easily when we were living on 2.5 acres surrounded on 3 sides by wilderness. We've had to move into a townhouse in the city for work, and things have been going downhill over the past few months. After yet another incident last night we are hoping this forum will have some answers so that we can all live a happier life together. Re: All About Freya, the Catfish. Welcome to the forum. Thanks for rescuing. So what was "the incident"?